A few weeks ago a close friend called me up because her family had bought a bunch of tickets to see The Phantom of the Opera at Seattle’s Paramount Theatre. Lucky for us, they ended up with a few extra tickets that they needed to sell. The tickets were an incredible deal and Seattle isn’t very far from where we live, so we leapt at the opportunity. On the day of the play we were ecstatic. In high school, several friends and I had become obsessed with the film version of The Phantom of the Opera. One of these friends made himself a Phantom-like cape for Halloween and even managed to convince the rest of our class that we should have a Phantom of the Opera theme for our grad banquet. While John wasn’t quite as familiar (or obsessed) with Phantom, he had acted in community theatre in high school and was looking forward to seeing a professional version of such a well-known play. At this point I should probably warn you about spoilers, just in case you have never seen the film or the play. Since our tickets were such a great price, we were hardly surprised when we were seated in the nosebleeds. Quite frankly, we didn’t care. We were too busy looking around at the ornate theatre itself. This was the only photo I was allowed to take in the theatre itself. As you can see, we were pretty far back. The brown object in the centre is the chandelier, covered up, and the stage is covered with a dark screen that makes all the objects appear covered in cobwebs. When the play started I felt a little disappointed. The opening scene begins with objects from the old theatre being auctioned off. In the film version, which I have pretty-well memorized, there are some significant looks exchanged between Raoul and Madame Giry throughout the auction. From our seats there was no way we could pick up on this kind of silent dialogue. Then, suddenly, the opening song began and I realized my disappointment had been misplaced. From the movie clip above you can probably get a sense of how crazy it was to be sitting in the middle of it all. The chandelier, which you can see in my photo of the theatre, was unveiled and lifted, causing light to flood the dark room. The cobwebs were lifted. The music exploded around us. The set rotated and changed completely as characters began to stream onto the stage. I felt surrounded and pulled into the story. This feeling was even more emphasized by the plot of Phantom, which takes place in an opera house and includes the audience as characters in the story. For example, several major plot points take place during operas, forcing characters to come out and apologize to us, the audience, for the disruption. This is what film just can’t fully recreate. The closest experience I’ve ever had was at an IMAX, but even there I felt surrounded by the story, rather than a part of it. While the mind-boggling accuracy of the singers of course made for excellent viewing, the set was what surprised me most. Before the play even began my friend leaned over to me and asked, “How are they going to do the lake scene? Do you think they will cut it out?” The scene she mentioned takes place shortly after the Phantom reveals himself to the heroine, Christine. He leads her through a hidden doorway in her mirror, then down a secret set of stairs, then finally across the lake in the basement in the theatre (which, incidentally, really does exist). For the life of me I couldn’t image how they would pull off this scene, but I couldn’t wait to find out. As I mentioned above, large sections of the stage were able to rotate. 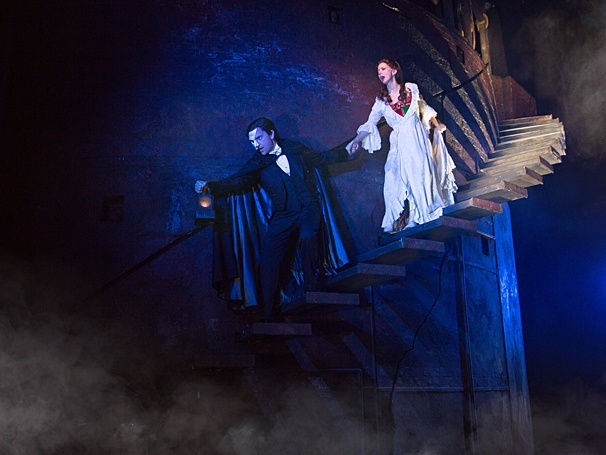 So when Christine followed the Phantom through her mirror the stage began to move; as it turned, it revealed a staircase that the Phantom and Christine slowly descended as they sang (don’t ask me how they got up there so fast). At the base of the staircase, a boat waited for them. The floor appeared to be covered with mirrors and fog spread over the stage, making the floor look just like water. 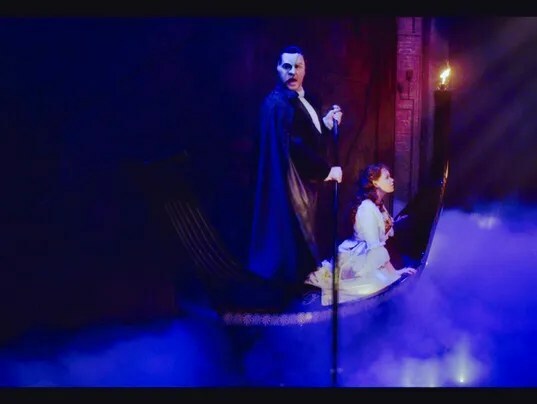 The boat itself must have been attached to a track because it moved slowly across the stage as the Phantom pushed it, gondola-style. It wasn’t just this scene that left me speechless. The Phantom’s disappearing tricks were equally shocking. They were accompanied by a loud bang and flash of light, which made at least one woman in the audience so surprised that she screamed. This isn’t from the performance I saw, but it’s the only example I was able to find. When the actors sang their final notes I felt genuinely sad that it was over and that I had to return to my own world. I’ve only ever been to small scale productions before, so I had completely been caught up in the complexity of the set and the set they had created. I’d encourage you, if you even get the opportunity to see Phantom of the Opera, or a similarly elaborate play, go for it! You’d be surprised at just how different the theatre experience can be. This entry was posted in art, Culture War Report, film and tagged boat, Broadway, chandelier, Christine, elaborate, Eric, experience, film, IMAX, Lake under the Paris Opera House, Paramount Theatre, Paris Opera House, Phantom of the Opera, play, Raoul, Seattle, set, set design, sing for me, spoilers, stage, surrounded, the movie, the Phantom, theatre, tickets. Bookmark the permalink.